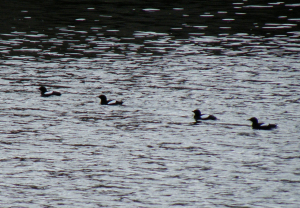 Black guillemots prospecting for nest sites? Observation - Black guillemots prospecting for nest sites? - UK and Ireland. Description: Some of seven black guillemots as far up an estuarine river as I have seen them, possibly looking at area under metal bridge and holes in wall. Some displaying - swim/fly along surface, flap wings etc. Some of seven black guillemots as far up an estuarine river as I have seen them, possibly looking at area under metal bridge and holes in wall. Some displaying - swim/fly along surface, flap wings etc.